72010-AR is rated 4.1 out of 5 by 29. Rated 4 out of 5 by Wayne from Great Product, But.... I've had my Delta 72010 Strainer installed now for about 5 years and have had no issues until now. All I need is a simple ten-cent seal for my strainer basket and can't seem to locate one anywhere. There needs to be a source for these seals, since NO seal last forever! Rated 1 out of 5 by Sharie from Delta 72010-AR kitchen strainer In the last 3 days I have had 2 people make the same complaint with the Delta 72010 kitchen strainer. The basket post has a round ball that seems to be rusting off. I called Delta on one issue and the customer called on the other issue. Rated 4 out of 5 by no nickname from Love the basket strainer, the color is perfect. The only thing I don't care for is the little knob on the stem of the strainer has broke off of one of the strainers. That is the only problem. Rated 5 out of 5 by April from Perfect This strainer is exactly what we wanted and needed. It is a quality product and was hassle free! Rated 1 out of 5 by MEG1 from Rust and non fuctioning strainer after one month of use Bought 2 Delta assemblies for my new kitchen remodel . The Arctic Stainless color great match. Finally installed on April 14, 2016. Past week noticed rusting at insertion area of basket and "nubby" that controls the filling of basin with water was GONE... So far only one side has rusted. not very satisfied with this product. Rated 5 out of 5 by Gary Mac from Good quality What can realy be said about a basket strainer, but good quality and matches our Delta faucet. will this flange fit a farmhouse sink with drain opening of 3.5&quot; and drain thickness of 1&quot;? Is Flange Strainer #72010 for a sink with a 3&quot; sink opening or is it for a sink with a sink with a 3.5 inch sink opening? Thank you for your question. 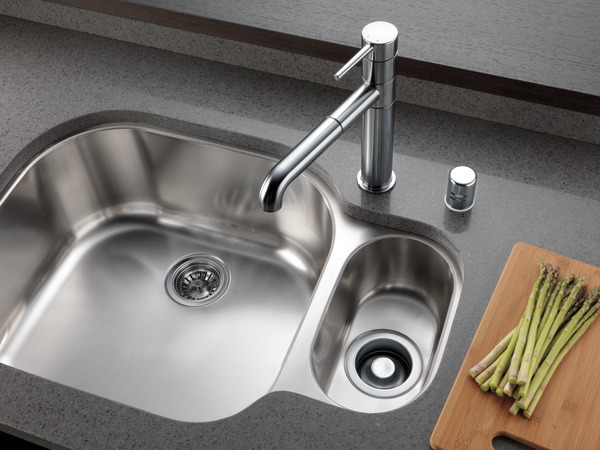 Delta Faucet model # 72010-AR is a top-mount installation for a 3.5&quot; sink opening. 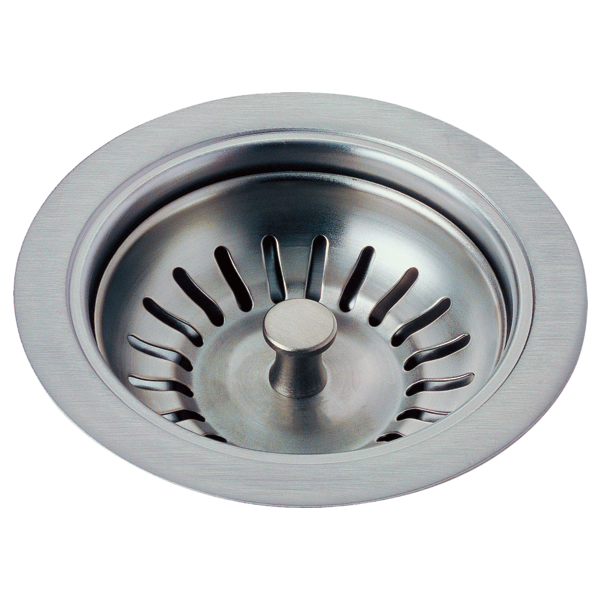 Just bought the Savile with Stainless Finish and was wondering what the best match in finish for the sink flange/strainer and disposal flange was and also will the sink and disposal flange fit in a Kohler Deerfield cast iron sink. I bought the trinsic faucet in champagne bronze to go in my laundry room. I need a sink flange to fit a apron front kitchen sink to match...does the brilliant brushed bronze match or is there another option for me? I do not intend to have a disposal. 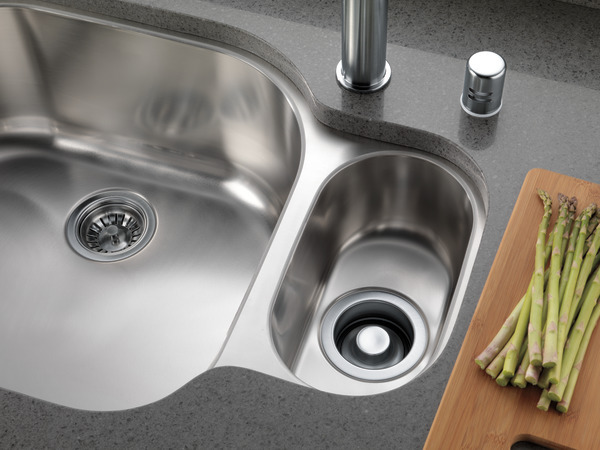 Which side of the rubber gasket faces up toward the sink when installed, the flat side or the ribbed side? When will this sink Flange &amp; Strainer be available in the champagne bronze? I just bought one of your faucets with this finish. Do you recommend another drain that would go with the champagne bronze? I need a 4 1/2&rdquo; drain for a sink with no disposal. Is there an installation guide for this anywhere? There is nothing listed here. Don't want to install it improperly.